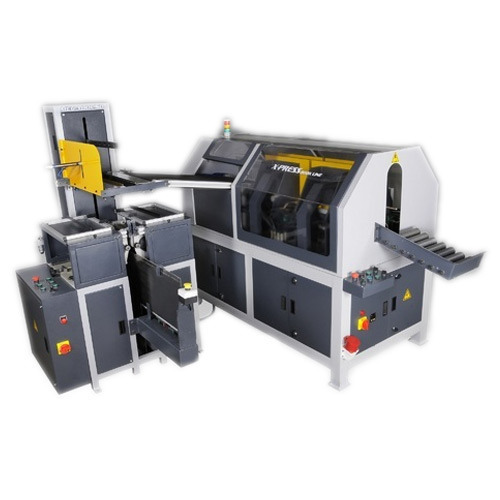 This Casing In Machine also known as Xpress Book Line and can be operated by one person. It is possible to glue with cold vinyl glue by enabling the application of glue on different material. The glue tank is easily detachable for cleaning purpose. After Casing-In the book automatically moves one by one in the conveyer towards the online hydraulic joint forming station. Every individual book is joint formed two times in two stations respectively. Finally finished book is delivered into rear end. Megabound (India) Pvt. Ltd. is a professionally managed organization, which has got established as a private limited company, in the year 2001. Since incorporation, we have focused our all efforts towards manufacturing, exporting and supplying a technically advanced range of Case Maker Machine, Casing In Machine, Edge Squaring Machine, Gluing Unit, Index Cutting Machine, Joint Forming Machine and Perfect Binding Machine. In the year 2001, we entered into the printing industry with our first range of machine, Perfect Binding Single Clamp Machine, in 2005, we launched Case Maker. We assemble our range using branded components, making use of which, we ensure the products’ efficiency, their high operational efficiency as well as outstanding performance. Also, with the incorporation of latest manufacturing technology, we have separated our range from other competitors and also enhanced our production capacity. Our products are acclaimed by the customers for some unmatched characteristics, which include precision engineering, excellent performance, sturdy construction, excellent functionality and many more.All such have helped us becoming the most preferred choice of customers, spread across the world. We are manufacturing our products with our own brand name MEGABOUND. We are an ISO 9001:2008 Certified Company. Our major markets include Southeast Asia, South America, Eastern Asia, Africa and South Asia.